Weight pull is a dog sport involving a dog pulling a cart or sled loaded with weight a short distance down a carpeted track. Many breeds participate in this sport, with dogs being separated into classes by weight. Sled dog and bully breeds excel within their respective weight classes, having been historically bred to pull sleds and carts as working dogs. 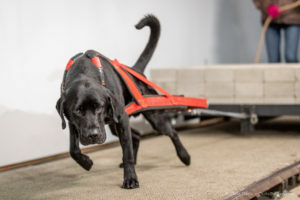 The dog is hitched to the cart or sled with a specially constructed harness designed to spread the weight and minimize the chance of injury. There are several organizations that host weight pull competitions, American Pulling Alliance (APA), Irondog Weight Pull, United Kennel Club (UKC), and International Weight Pull Association. Southtown K9 will be hosting sanctioned UKC competitions through Northern Illinois K9 Association.